Bioroids and Bombots: Thoughts on Military Spacecraft: Part One. Thoughts on Military Spacecraft: Part One. Any discussion of military spacecraft assumes there will be some reason or need to project military force off-world. In science-fiction we often see spacecraft engaged in great space battles or conducting planetary invasions. I suspect that both of these situations will in reality be rather unlikely. One reason for this is military spacecraft are likely to be very expensive. Currently even the richest nations can only field a handful of aircraft carriers. How many large spacecraft a future power can field will depend on how important space warfare is to them and the resources they have but it seems likely the numbers will be in the dozens rather than the hundreds or thousands. The great space armadas we see on the movie screen seem unlikely. Space battles are likely to be more intimate affairs, if the capital ship is to be risked at all. As an aside, the variety and cost of equipment any spacecraft would need on board is staggering! Even a relatively simple asteroid belt craft may need a mortgage of several generations to pay for it. For easy visualization let us consider a capital ship the size of a Nimitz class aircraft carrier. The Nimitz is just over 1,000ft or 330m long (a sonic second!). In GURPS Spaceship (4e) terms this would be SM+13, massing 300,000 tons. The Nimitz can carry 5,000-6,000 personnel and around 90 aircraft. The capital spacecraft will probably need a greater proportion of its capacity devoted to propulsion, life support and storage. On the other hand it will have a greater degree of automation and probably need less crew members to actually run it. A generous but reasonable estimate would be a ship that can accommodate about 3,000 personnel in addition to the crew. That sounds a lot but in military terms that is only three or four battalions of ground troops. That is not a very big force to invade a reasonably populated planet, no matter how advanced your weapons are. Troops are also going to need vehicles, engineering equipment, artillery, support and transport aircraft/spacecraft and a whole host of other stuff that is going to take up space in the capital ship. A handful of Nimitz-sized ships with a few thousand men in each will not be enough. Invading a planet will probably require hundreds and possibly thousands of such ships, resources that most combatants are unlikely to have. The planet being invaded will also have a home team advantage. Its forces will be many times larger. If it is a reasonably advanced civilisation it can build surface to orbit weapons far more powerful than anything that is mounted on the invading ships. The spaceships available to the major powers in Transhuman space are only about half the length of the Nimitz-sized craft described above. In game terms they are Sm+10 or SM+11, 300-450ft long or less and mass 10,000-30,000 tons. We are told that Space Control Vehicles (SCV) carry between a battalion and a platoon of troops and Space Dominance Vehicles (SDV) less than a platoon. Of course, in TS many of the infantry will be cybershells that require less accommodation and resources than human/ parahuman/ bioroid soldiers. An SDV or SCV may have more ground combat capability than the number of soldiers carried would at first imply. Large scale invasions still seem relatively unlikely, even when this factor is considered. A more likely application of military power in space will be of various types of raiding. A small fleet of ships might be used to deliver a punitive strike or conduct a commando raid to acquire materials or information. Enemy merchant shipping may be a target for such actions. The days of gunboat diplomacy and privateering may return on the high frontier. Another military mission for the military in space might be termed “order enforcement”. Ships will need to be inspected for contraband and distant outposts will need to policed for illegal activities. A law enforcement officer or inspector will need something to back-up his authority and this is likely to be a military unit. Many of these operations will require “boots on the ground” and face to face interaction so it is likely that infantry-trained personnel will be an important part of many future space operations. In the space operas warships bristle with turrets and gun emplacements. In reality the space warship may look much more like a cargo ship for a very simple reason. Much of its capacity will be devoted to cargo space. The ship will look more like the Graf Zeppelin than the USS Missouri. There may in fact appear to be little difference between a space warship and a merchant ship. This will be particularly true if it is seen necessary to provide freighters with some defensive armament of their own. The distinction blurs further when we consider that military vessels might be used to transport high value cargos. GURPS Spaceships has the supplies needed for 500 man-days in space as massing one ton. When we start considering that spacecraft in TS may make voyages of several months duration it becomes apparent that even a single-person deep space ship will have to be quite large to accommodate all the needed supplies. A deep space war vessel is likely to be very large. A spacecraft may need to operate away from base for weeks or even months of time. For long voyages the ship’s cargo space will be used for supplies and replacement parts. On a more aggressive mission many of the cargo bays will be loaded with ammunition instead. For a raiding mission many cargo bays will be filled with ground troops, cybershells, equipment and shuttle craft. Bays might also be loaded with fuel or reaction mass. The cargo spaces of a spaceship may be used to carry large volumes of ice and water. As well as serving as a reaction mass water can be used as a heat sink. This suggests that a ship may include an extensive plumbing system to redistribute and circulate water as needed. For many of their possible roles cargo bays will need hatches to the exterior. It follows that provision may be needed to pressurize or depressurize individual bays as required. In effect many of the cargo holds will be large-volume airlocks. Depending on their contents and role many of the cargo holds will spend much of their time depressurized. For a hold used as a magazine for attack drones it is logical to have the hold at ambient conditions with the exterior. This also minimises the likelihood of fire or atmosphere loss if that hold takes battle damage. Holds containing perishables may also be kept in a vacuum and unheated. The greater the cost of a military system the greater the incentive to make it perform multiple roles. Large spacecraft will be very expensive! The difference between an SDV and an SCV may in reality be more one of cargo than actual design. The crew compliment for these ships would be surprisingly small for a ship so large. When each crewman or passenger needs months of supplies and life support it is more efficient to use automated systems whenever possible. In TS the Salahudin Samboja-class SDV is fully automated. For many other military spacecraft the role of the crew may be more along the lines of directing or advising the ship’s AI rather than actually operating the systems. In Transhuman Space the sphere configuration of spacecraft is mainly used for unmanned defence satellites and AKVs. Larger spherical ships are known but relatively rare. I believe a sphere would be a useful shape for a military spacecraft. Ball-shaped spaceships are relatively rare in fiction. 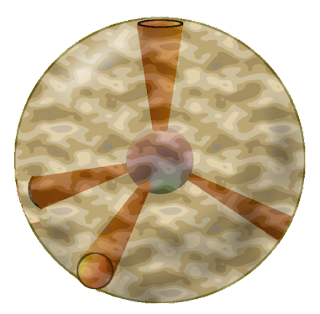 Heinlein’s “torchships” were shaped like a top: a hemisphere joined to a cone with the drive at the point. 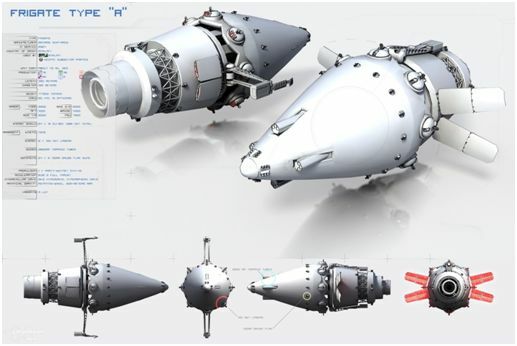 One possible configuration for a spherical ship would have the engines being built in the centre of the sphere and four exhausts radiating outward in a tetrahedral arrangement. By using the exhausts in varying combinations the ship can change direction without needing to reorient. Construction of such a ship in orbit would be relatively simple. You position the engine and then build outward in every direction. 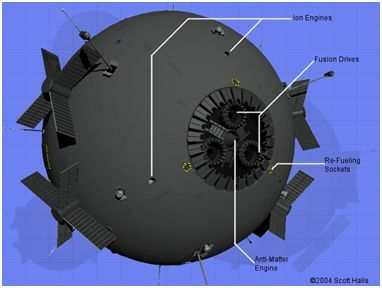 Below: Spherical ship with retractable radiator arrays from the game "Silent Phoenix". A sphere has a number of other advantages. A compact shape like a sphere takes less energy to reorient than an elongated one. Its ratio of surface area to volume is low so its surface will absorb less heat from attacks such as lasers. On the negative side the shape loses built up heat less readily. The surface area ratio also means you can have a thicker layer of armour or shielding for a given mass. The armour layer can also be more uniform, with a lesser chance of weaker areas. Generally in science fiction it is assumed the crew quarters should as far from the drive/ reactors as possible so a cylindrical shape is a more common configuration. The long length of the cylinders is also used in TS to facilitate the mounting of very long neutral particle accelerator (NPB) weapons. Another feature of the Transhuman cylindrical craft is that some of them are “spikes”. They have pointed noses to increase the chance of incoming fire being deflected. Like a Mediterranean war galley the ship attempts to keep its nose towards the enemy while preferring to land attacks on its enemy’s flanks. As well as spheres, spikes, tops and cylinders there are a number of other possible shapes for warcraft. Cones might be suitable for smaller vessels such as attack drones. Rhomboids, trulloids and ovoids are also possible. Below: Frigate ship from the game "Frontiers". The positioning of the control room also needs some thought. Does it really need to be at the front of the ship, the region most likely to be exposed to enemy fire? Protection of the crew from radiation seems a more important priority. This suggests the control room should be deep within the ship’s body. It also suggests that the control room is located close to the living quarters and sickbay to make the most efficient use of radiation shielding. Depending on the drive system used you may want the engines as far away from the crew as possible. Spaceships in films tend to place gigantic engines at one end of the ship. These all seem to thrust in one direction so if the ship wants to slow down it would have to flip over and point its engines “forward”. This is the mechanism used in TS, which would obviously cause problems when it came to aligning the forward firing particle beam weapons with a target. An alternate configuration would be to give the engine a cluster of nozzles in a variety of directions including forward. Such an arrangement could pull the ship as readily as it could push it and the ship might spend half its time moving engines first. Using such an arrangement would mean not having to yaw the main body more than 45 degrees for any course change. While I have drawn the illustration with rocket nozzles this configuration could use other systems such as a cluster of pusher plates. A variation of this concept might resemble a medieval mace in appearance. The “head” would be the drive module with thrust ports orientated in various directions and the “shaft” would be a cylindrical body for the rest of the ship. The illustration shows a large radiation shield placed between the drive module and the main body. The illustration below combes the concept described above with the concept of a spherical hull. The smaller sphere is the drive module and three of the thrust ports are visible. 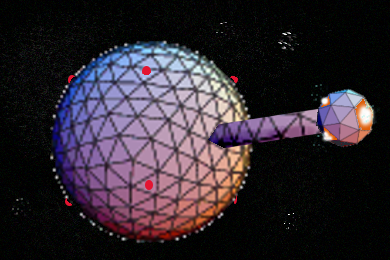 The red spots on the main sphere represent the positions of laser weapon reflectors. The geodesic construction would allow for easy repair of battle damage from standard components. Defensive Weapons for Military Spacecraft.